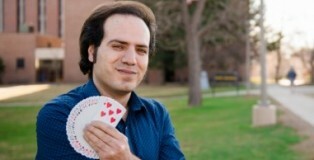 The PhD candidate in mechanical engineering at Michigan Tech says his novel approach to language fluency originated in Reno, Nevada. "Now it makes more sense, right, about the card tricks?" he asks, smiling. Actually, his motivation was less about living in a gaming-industry hub and more about roommates who went to bed too early, says Jafari Kang, who works with Hassan Masoud, an assistant professor of mechanical engineering-engineering mechanics. Both came to Michigan Tech in 2017 from the University of Nevada-Reno. The next Banner 9 Admin drop-in style training session will be offered at 9 a.m. Monday (June 18) in R.L. Smith 120 (MEEM). This is an open lab and will be available for up to one hour. Stop by and have our SAIS staff on hand to answer your questions. For more information about Banner 9 Admin, visit mtu.edu/banner-reporting/. Former Michigan Tech hockey captain Cliff Watson won the ECHL Kelly Cup with the Colorado Eagles June 9. The Eagles defeated the Florida Everblades 3-2 at Germain Arena in Estero, Florida in Game 7 to win their second straight Kelly Cup. Watson played eight regular season and 22 playoff games for the Eagles after he was traded from the Utah Grizzlies on Feb. 15. He had 11 points this season for the Eagles, including two goals and four assists in the playoff run. Watson played 162 career games over his four years in a Tech uniform, missing only one game from 2013-17. He was the captain over his final two seasons, an alternate captain as a sophomore, and tallied 42 career points on eight goals and 34 assists. Read the full story and find out more about Husky sports on michigantechhuskies.com. Staff and faculty job descriptions are available in Human Resources. For more information regarding staff positions, call 7-2280 or email jobs@mtu.edu. For more information regarding faculty positions, contact the academic department in which the position is posted. Research Engineer/Scientist I, Mechanical Engineering - Engineering Mechanics. Apply online. Angie Carter (SS) is presenting research at the joint Association for the Study of Food and Society and Agriculture, Food and Human Values Society Conference today (June 15) in Madison, Wisconsin. For summer student residents, visitors and meal plan holders, Wadsworth Hall will open for the remainder of the summer, starting tomorrow (June 16). The last summer meal served in Douglass Houghton Hall will be dinner today (June 15). The Vice President for Research Office has updated the graduate student tables for budgeting stipends and tuition. These rates are to be used immediately in proposal budgets to external sponsors. The tuition rates per credit differ between Non-Engineering/Computer Science and the Engineering/Computer Science disciplines. Remember to take this into account when budgeting for one credit. Budgeting for research mode is now an option at the proposal stage; those rates are also included in the table. The updated GRA Stipend Rates and GRA Tuition Rates tables can be found on the VPR forms page. Federal funds targeting upgrades to Michigan Tech's shooting range has been covered by several media outlets, including, WLUCTV6, SC Now morning news, Huron Daily Tribune, WOOD and UpNorthLive. An article, co-written by Joshua Pearce (MSE/ECE), accessing the nuclear arsenal tipping point has been covered by several national and international media outlets including alphr.com, Videnskab•dk (Denmark), 9News (Australia), GIZMODO, BT.com, IFL Science, British Telecommunications, Science Alert, the Daily Star (UK). Michigan Tech's next president Richard J. Koubek was mentioned in the article, "New Presidents or Provosts" in Inside Higher Ed. Guy Meadows (GLRC) was mentioned in the article "Coastal Resiliency Training Workshops to Focus on Northwest Michigan Region," in the Manistee News Advocate. Meadows is among the presenters in the workshop, "Introduction to Coastal Dynamics and Resiliency" June 21 in Traverse City, Michigan. Fredric Quivik (SS, retired) was awarded not one, but two awards by the Society for Industrial Archeology (SIA) at their annual conference in Richmond, Virginia June 2. He was this year's recipient of the General Tools Award for "individuals who have given sustained, distinguished service to the cause of industrial archeology.” The award specifies that the recipient has to have given noteworthy, beyond-the-call-of-duty service, but in areas other than academic publication. That said, by separate committee, who knew nothing of the first award, Quivik also won the Robert M. Vogel Prize (for the second time in his career, having won it in 2005 as well) for best article to appear in the society’s journal, The Journal of the Society for Industrial Archeology, within the past three years. The winning article was "Nuisance, Source of Wealth, or Potentially Practical Material: Visions of Tailings in Idaho’s Coeur D’alene Mining District, 1888–2001", which appeared in IA vol. 39, a special issue on industrial waste. Information on the SIA and the awards can be found on the Society for Industrial Archeology website.